Welcome to Bancroft...Ontario's Most Talented Town and a "A Four Season Playground"
Hastings County was established in 1792 as the eleventh county of Upper Canada. The first settlers were United Empire Loyalists and later came Irish settlers fleeing the potatoe famines. During the town's early years, it had several names. It started as York Mills, then York Branch, The Branch, and finally it became York River in 1861. The name was changed again in 1879 to Bancroft by the energetic Senator Billa Flint who was instrumental in bringing many skilled tradespeople to this area. The name was changed in honor of his wife, Phoebe, who's maiden name was Bancroft. The York River flows through the centre of town, emptying into the Madawaska River before joining the Ottawa River. This area was the centre for logging, trapping, and mining in Hastings County; from 1858 to 1872 there was a steady influx of settlers eager to start their homes and get title to the free 100 acre parcels being offered. 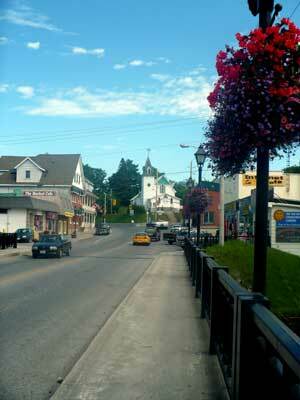 The Town of Bancroft is known as the "Mineral Capital of Canada". Over 1600 different mineral species have been identified in this part of the province. The annual "Rockhound Gemboree" in August attracts thousands of people from around the world. Uranium mining in the 1950's and 60's created a modern day boom in this area. At its peak, the mill was treating 1600 tons of ore per day. Bancroft became an incorporated village in December of 1904. Bancroft is a picturesque community in the heart of North Hastings on the Canadian Shield, strategically located 3 hours west of Ottawa, 1 1/2 hours north of Belleville and 1 1/2 hours northeast of Peterborough. The area offers year round activities including live theatrical performances at the Village Playhouse, exhibits at the Art Gallery, rock hounding at the Annual Gemboree, cottaging and fishing at numerous area lakes, snowmobiling on the best trails in Eastern Ontario, four wheeling on the Hastings Heritage Trail, great hiking and nature walk trails. After a day of bird watching from the "Hawks Watch" located on the top the Eagle's Nest, relax outdoors while you listen to live entertainment at the Millennium Bandshell beside the York River. Autumn is spectacular - the foliage turns to golds and reds. 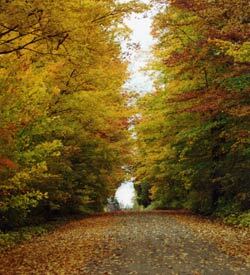 Enjoy a hike a Egan Chutes Provincial Park or take a day trip to Algonquin Provincial Park to experience the array of fall colour. 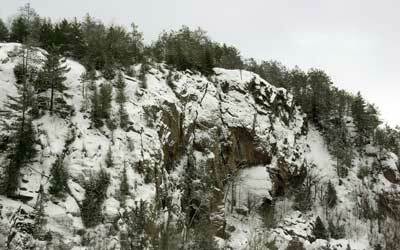 For hunting enthusiasts, the Bancroft area offers game including partridge, deer and moose. In 2000, elk were re-introduced to the area and Elk Route viewing and marketing initiatives are being established at this time. The York River flows through the centre of town and is being developed with park areas, playgrounds and trails. The compact and walkable downtown shopping area consists of numerous boutiques offering unique gifts and crafts. Bancroft has so much to offer and yet maintains a quiet, relaxing pace. In June 2004, Bancroft was the first place winner in TVO Studio 2's Most Talented Town contest, winning out over 150 other entries. Bancroft generates its own arts scene and the arts community is a self-nurturing grassroots movement that goes on all year 'round.